These onion rings are a perfect bar snack or accompaniment to a burger or main. The addition of chilli and cayenne pepper gives an extra kick and the blue dressings adds a salty, creamy finish. Combine buttermilk, KNORR Mixed Chilli Puree and sugar in a bowl. Combine flour, baking powder, KNORR Aromat and Cayenne pepper. Dip onions in buttermilk mixture, shaking of excess liquid, dip in flour mixture shaking of excess, then dip again in the buttermilk mixture and again in the flour mixture. Deep fry in batches until golden and crispy. Combine HELLMANN'S Mayonnaise and blue cheese. 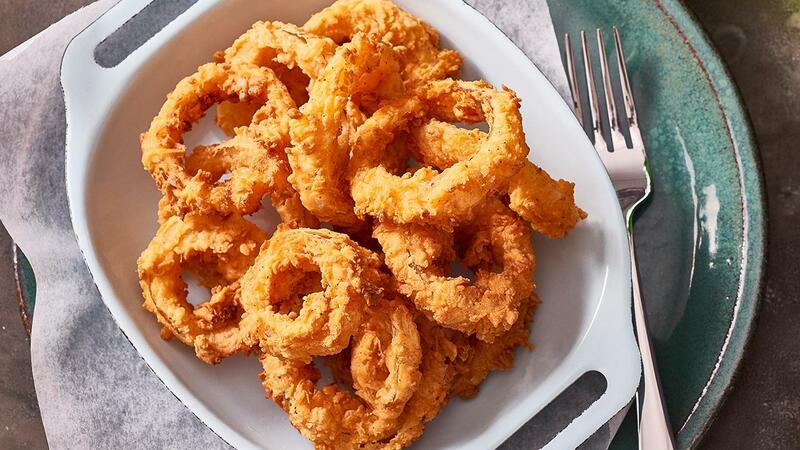 Serve onion rings with blue cheese dressing. No need to pre-soak the onions for this recipe, which will save you time.